The Spring 2000 "The Rattle"
Editor’s Note: Hundreds of guests and members of Theta Chi Fraternity visit the International Headquarters in Indianapolis every year. Be they participants in Fraternity events in the city or travelers on their way to some point on the compass, or conventioneers, or undergraduates on a road trip to “See National,” the impact upon them of Fraternal historical artifacts and emotional triggers seems to be consistent from one man to another. In the morning of November 2, 1999, a phone call that seemed initially like so many others was received by the Headquarters staff and a few casual and highly informative questions were answered positively. Less than an hour later, an alumnus brother and his wife walked back into personal and Fraternal history in a way only a few of our members could ever do. This is his brief recollection of that visit. Our visit to Theta Chi Fraternity’s International Headquarters in Indianapolis, Indiana was really unplanned. My wife, Marion, and I knew we would pass through the city but did not expect to have time to stop. When we found ourselves with a few extra hours, we called Theta Chi to see if a quick visit was a possibility. It was! I should mention that my father, George W. Chapman, had been a former Executive Director of Theta Chi for exactly 20 years prior to his retirement on January 1, 1968. He, and a group of other students from Philadelphia, had formed Omega Chapter at Penn State in early 1919. So I have a special connection to Theta Chi, in addition to my own membership. Brother El Ahlwardt, Director of Development, for Theta Chi Funds, Inc. and Editor of The Rattle, and Scott Thomas, Director of Chapter Services, met us at the front door of the beautiful Headquarters building. I must admit that it has been many years since I have had the occasion to use the Theta Chi grip, but instinct took over and our formal greeting was as though rehearsed. Brother Ahlwardt and Brother Thomas were as fine a pair of gentlemen as we could have met anywhere, and a great credit to our Fraternity. As part of our tour of that building, we were ushered into “The Chapman Library,” a beautifully furnished room that would seem to be the heart of Theta Chi since it contains displays of all items of our history since 1856. This was a most emotional moment for me. I had previously visited “The Chapman Library” when the Headquarters was in Trenton, New Jersey. But I had assumed that, with the movement of the Headquarters to the Midwest in the early 90s and the passage of some 30 years, things would have changed. If the library still existed, it merely had a new, more modern name. I hope my brothers and my wife could excuse the choke in my voice when I saw my father’s portrait and a display cabinet of his writings, books, photos, awards, etc still intact in “The Chapman Library.” This was a thrill and a moment of nostalgia I shall not soon forget. There were also mementos of other Theta Chi greats of that generation. Men like Sherwood Blue, Dusty Rhodes, Joe Ross and others, who guided the Fraternity through the difficult post-war years. As a young man, I knew these men as colleagues of my father, but I did not yet understand the devotion, dedication, and drive with which they served their Fraternity. They gave freely of their time and energy and resources, sometimes at the expense of their personal and business lives. Their obsession was to see that Theta Chi grew and prospered, and along with all those devoted brothers who followed, this Fraternity has been well served. We continued our tour throughout the great Board Meeting Room and through the various office areas where we met the staff members who keep the behind-the-scenes business of Theta Chi running smoothly. We inspected the Pathway of Brotherhood in front of the HQ building, paved with memorial engraved bricks. We noted with satisfaction the adjacent bricks with the names of my father, my brother Philip, and myself-all members of Omega chapter at Penn State. One humorous incident came to mind during our tour. My father’s formal retirement in 1968 was held during the 112th Anniversary Convention in Miami Beach. He urged my sister, Ann; my brother, Phil; and myself to attend if we could. By pre-arranged agreement, we all advised him that we could not be able to join him. In the meantime, we made secret plans to fly to Miami and surprise him with our presence. We joined the reception line, but when our time came to greet Dad, there was no wild exclamation of joy as we expected. He merely shook our hands, and with a twinkle in his eye, passed on to the next guest. His usual dignity and poise turned the tables and we were the ones surprised-the joke was on us! It was the subject of much family humor for years! Our thanks to Brother Ahlwardt and Brother Thomas for being such kind and friendly hosts on short notice. I can truly say that Dad would have been extremely pleased and proud to know of the beauty of the International Headquarters, and the excellence of the leadership and staff of our beloved Fraternity, Theta Chi. We also took great pride in the beauty and practicality of the Headquarters Building. If George W. Chapman needed another title, it might rightly be Mr. Theta Chi . . . as he has served as Executive Director for the past twenty years and has supervised the fraternity's growth from 75 chapters in 1947 to the present 144 active chapters and 5 colonies. Mr. Chapman began his life-long interest in fraternities at Penn State where he was president of Phi Tau Alpha which in 1919 became Omega Chapter of Theta Chi, and he was one of the original initiates. Graduating from Penn State College (now University) in 1920 with a Bachelor of Science in Civil Engineering, George Chapman possessed a journalism urge in his undergraduate days that led to such campus posts as associate editor of Froth, humor magazine; assistant editor of "Penn State Engineer," and editor-in-chief of El Dorado, literary magazine. As a result he became a member of Pi Delta Epsilon, Journalism fraternity. He was on his class teams in soccer, baseball, and lacrosse and a member of the varsity soccer and lacrosse squad. After graduation he was in the steel equipment business as a salesman and sales manager for 19 years. In 1939 he became a producer's representative in the commercial motion picture industry. From 1941 to 1947 he wrote, directed, and produced institutional, advertising, and training motion pictures. During the war years he wrote and directed many pictures for the U.S. Office of Education, the United States Army and the United States Navy Department from which he received a Citation for his work. In 1951 he received the graduate degree of Industrial Engineer from Pennsylvania State University. The Philadelphia Council Boy Scouts of America claim George Chapman as a member for over 55 years. He is a member of the National Council, Boy Scouts of America and of the National Committee of the Order of the Arrow; he is a charter member and the first chief of the first lodge of this organization. He has been awarded the Silver Beaver of the Boy Scouts and the Distinguished Service Awards of the Order of the Arrow and the Philadelphia Council of B.S.A. He is a member of Alpha Phi Omega. He is presently a reserve officer in the U. S. Coast Guard Reserve, Ret. He served with the U.S. Naval Reserve during WW I and the U. S. Coast Guard Reserve during WW II. George Chapman never ceased to participate actively in Theta Chi. Following service as alumnus ad-visor of the Penn State chapter, he became one of the first appointed counselors in 1935 in the new regional program adopted by the fraternity; of which he served as chairman of the organizing committee. In 1937 he was named National Marshal and in 1941 he became National Treasurer, serving on the Grand Chapter a total of 9 years. In 1939 he instituted, programmed, and con-ducted the first School of Fraternity Practices which has been an important part of every Convention since then. He then produced the Handbook of Theta Chi Fraternity in two volumes, one for undergraduate reference, the other for alumni. He later produced and edited the Manual of Theta Chi. Both these publications have proved helpful to many other national fraternities in producing their own publications. All of Theta Chi's awards and recognitions were originated and designed by George Chapman. Unique in these recognitions is the Appreciation Award which honors and recognizes women who have aided the Fraternity Movement. Theta Chi is perhaps the only fraternity which has an award for women. George Chapman has been accorded honors of Theta Chi . . . he holds the Distinguished Service Award, Alumni Awards presented by his chapter and by the Grand Chapter, and the Golden Guard Certificate. He has been made an honorary member of more than 80 chapters. His wife, Mary, appropriately wears the Appreciation Award. Governors of many states have conferred upon him their state's honor; he is Goodwill Ambassador for North Carolina, has been commissioned Lt. Col. by the Governor of Florida, appointed an Admiral in the navy of the state of Nebraska, and is a Lt. Col. in the Alabama State Militia. He is married to the young girl whom he romanced during college, Mary E. Craley. They have three children (2 Theta Chi sons and a Kappa Kappa Gamma daughter), and seven grandchildren. The Chapmans presently reside in Meadowbrook, Pennsylvania, a northern suburb of Philadelphia. They are members of the Society of Friends. Over the years he has won the respect of the fraternity leaders who make up the National Interfraternity Conference ,Executive Committee through the authority that comes from experience mixed with diplomatic presentation of his ideas. He has been willing to give of his time and energy "beyond the call of duty" because he is so thoroughly dedicated to the fraternity philosophy. George Chapman served as an energizing force in making the College Fraternity Secretaries' Association a more positive agency in interfraternity affairs. He has served in every major office of the organization. As chairman of the publications committee, he originated and directed the annual publication of the C.F.S.A. Directory, Dean's Directory, and the College and University Calendar which have great value to fraternity administrators. For 9 years he represented the Secretaries on the N.I.C. Executive Committee. With a background of practical experience of 50 years of service for his fraternity as layman and pro-fessional, George Chapman can truly be called Mr. Theta Chi. Knowing that his fraternity is only as strong as the system of which it is a part, he is a strong believer in sharing ideas and procedures with other fraternities and believes in doing everything he can to help further the Fraternity movement. And, George W. Chapman is a person who practices his beliefs. George Chapman has signified his desire to retire from the position as our Executive Director some time within the ensuing two years. True to his principles, he has indicated his eagerness to cooperate with Grand Chapter in acquainting his successor with the vast range of responsibilities, operations, procedures and manner-of-doing-things in his major position of leadership. National President Howard Alter named a Committee of Grand Chapter to initiate a search for Mr. Chapman’s successor. Vice President Mark McColm is Chairman of the committee, and Joseph D. Ross, Jr., National Secretary, Spencer Shank, National Counselor, and Joseph C. Ross, Jr., National Marshal, are the other committee members. George Chapman’s extended service in our National Office. Entering the work when post-war enrollments and pressures were moving towards high tide, George kept Theta Chi abreast of the times. In a sensible and realistic manner, George endeavored to implement Starr Lasher’s thesis: If Fraternity is good, it is good’ for a maximum number of eligible men. Continuously working with Alumni, sometimes with frustration and futility and against long odds. Many new chapters were very, very young. Their Alumni may have been but a year or two older than their Seniors!!! We name it; you know it: Membership qualifications. Long discussed and much studied, this subject moved rapidly to the fore during George's years of service. That Theta Chi has continued to function as a major National Social Fraternity during this troublesome period says much on the subject of stability, good sense and great care on the part of our National Leaders. Finance. This problem is ever present, because more and better service is a continuous fraternity goal. And service somehow is tenaciously related to costs and available funds. Personnel. In these years of tremendous scientific, technological, industrial and professional expansion, it has not been easy to recruit and retain personnel to work on fraternity staffs. Somehow, it has been done, at what effort we Alumni out in the Regions scarcely know. Growth. This is best expressed in terms of actual membership on campus, membership in Alumni ranks and in roster of chapters. True, other National fraternities have undergone similar growth. But Theta Chi kept pace and continues to find its place among the top ten. This kind of thing is done by the work of many men, yes. But leadership is imperative, too. Emerging nationally. We have never heard George say as much, but suspect that he is quietly and gratefully proud of the way in which Theta Chi has moved to the forefront in National Fraternity Affairs. We do not here refer to numbers; we refer to positions occupied and leadership exercised in National Interfraternity Conference, College Fraternity Secretaries Association, and so on. It was the pointing, guiding hand of George W. Chapman that found and indicated the necessary who, how, and when in much of this significant development. We become International. Another reason for pride we gladly name is the establishment of our first non-U.S. Chapter, up at University of Alberta, at Edmonton, Canada. J. C. Byrd did the “leg work” here and is entitled to the credit for this successful operation. One could expand this pleasant thought, but to mention it should be sufficient. All of us walk a little taller, are a little straighter since we have had our Zeta Gamma Chapter. There will be many reviews Theta Chi over these past twenty years. The foregoing presents a few sectors of a very large Circle. 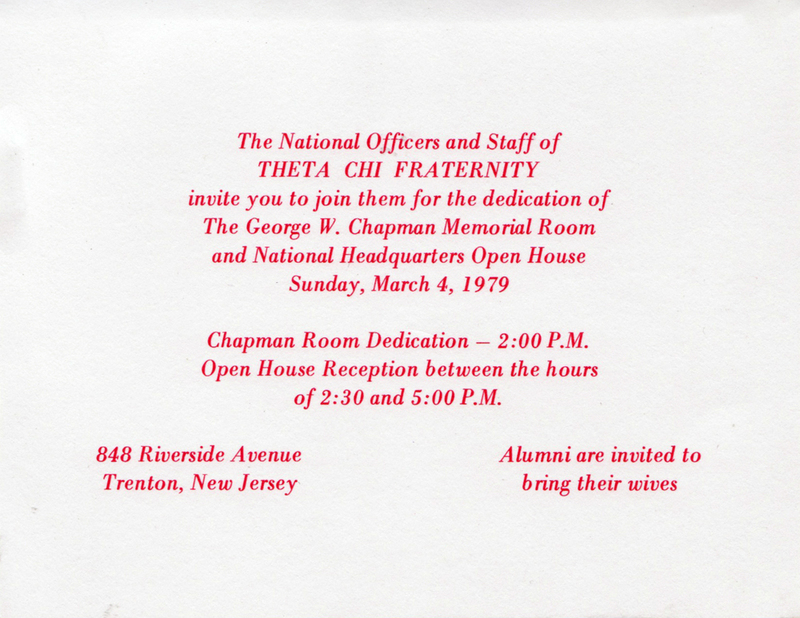 Our counseling corps will yield no one in acknowledging the effort and achievement in Theta Chi, that radiated out from the Broad Street Bank Building, Trenton, during the Chapman years. Let our concluding statement here be on the note thai‘ a man’s ultimate worth lies in the manner and degree to which he favorably influences the lives of fellow man. May we suggest to George that he pause, if only a brief moment, and look about him. What he may see is the ever-enlarging Circle of Theta Chi. Within that Circle stands the legions of men whose lives he so effectively touched; within it, too, he may find the ultimate measure of his service. If George W. Chapman needed another title it might rightly be liaison officer between the National Interfraternity Conference Executive Committee and the College Fraternity Secretaries Association, for, of the fourteen years he has been Theta Chi's efficient executive director he has also served nine years as representative of his fellow secretaries and directors to the highly important N. I. C. Executive Committee. While this post was originally designed as that of an observer with the idea that the representative would report back to the executive secretaries of the member fraternities the attitudes and policies of the Executive Committee, the relationship of George Chapman has been much more positive. Because of his seasoned judgment, his wide knowledge of Greek affairs, his thoroughgoing faith in the fraternity as an institution of education value, and his clear, mature thinking, he has been accepted not merely as an observer, but as a wise counselor, and he has been encouraged to participate in the discussion of fraternity problems and in the administration of the Executive Committee. He serves on various subcommittees because his point of view and his contributions have been found valuable. To the credit of George Chapman it can be said that he has filled his role as a representative in a way that has made for a better fraternity system. He won the respect of the fraternity leaders who make up the N. I. C. Executive Committee through the authority that comes from experience mined with diplomatic presentation of his ideas. He has been willing to give of his time and energy “beyond the call of duty” because he is so throughly dedicated to the fraternity philosophy, and Theta Chi Fraternity has been willing to support wholeheartedly and unselfishly his efforts to strengthen the entire fraternity system. George Chapman has been an energizing force in making the College Fraternity Secretaries’ Association a more positive agency in interfraternity affairs. He served as treasurer, secretary, and vice president of the organization, and was president in 1957-1958. As chairman of the publications committee he established, and directs the annual publication of the C. F. S. A. Directory, the Deans’ Directory, and the College and University Calendar which have been of inestimable value to fraternity administration. In August of 1957 he established News and Notes, and his editorship provided one of the instruments which has proved most effective. This monthly publication presents things, good and bad, that are going on among the Greeks, bringing an understanding of the problems facing fraternities and sororities, alerting the organizations to the need of action on their part. Through the years, News and Notes has grown in importance. As editor, publisher, and reporter, George Chapman has served in making his readers more conscious of the challenges that Fraternities and sororities face because of today's trends in the educational world. News and Notes arouses both attention and thinking from which sometimes action develops. A graduate of Pennsylvania State College (now University) in 1920 with a degree of bachelor of science in civil engineering, George Chapman nevertheless possessed a journalism urge in his undergraduate days that led to such campus posts as associate editor of Froth, humor magazine; assistant editor of Penn State Engineer; and editor-in-chief of El Dorado, literary magazine. As a result, he became a member of Pi Delta Epsilon, journalism fraternity. He was on his class teams in soccer, baseball, and lacrosse, and a member of the varsity soccer and lacrosse squads. He was president of his chapter and a member of the IFC. After graduation from Penn State, he was in the steel equipment business as a salesman and sales manager for 19 years. In 1939 he became a producer’s representative in the commercial motion picture industry. From 1941 to 1947 he wrote, directed, and produced institutional, advertising, and training motion pictures. In the war years he wrote and directed many pictures for the U. S. Office of Education, the United States Army, and the United States Navy department from which he received a citation for his work. In 1951 he received the graduate degree of industrial engineer from Pennsylvania State University at the same time his daughter Ann was ’graduated. With 50 years’ membership in the Boy Scouts of America, George Chapman is a member of the Philadelphia Scout Council and has been for many years a member at large of the National Council. He is also a member of the National Committee of the Order of the Arrow, the scout honor society of which he was a charter member and the first chief of the first lodge. He has been awarded the Silver Beaver of the Boy Scouts of America and the Distinguished Service Awards of the Order of the Arrow and the Philadelphia Scout Council. He is a member of Alpha Phi Om,egg, the national collegiate service organization for scout-trained men. Following service with the U. S. Naval Reserve in World War I, and the U. S. Coast Guard Reserve in World War II, he became a member of the Coast Guard League and is presently a reserve officer in the U. S. Coast Guard Reserve. George Chapman never ceased to participate actively in this fraternity from the time of his initiation, and even before, because he was instrumental in bringing the local fraternity of which he was the president into Theta Chi. Following service as alumnus adviser of the Penn State chapter he became one of the first appointed counselors in 1935 in the new regional program adopted by the fraternity, and of which he had served as chairman of the organizing committee. In 1937 he was named national marshal, and in 1941 he became national treasurer, serving on the Grand Chapter for nine years through 1946. In 1939 he instituted, programmed, and conducted the first School of Fraternity Practices which has been an important part of every convention since then. The school pointed up the need of a manual of fraternity practices, policies, and procedures, so he produced the Handbook of Theta Chi Fraternity in two volumes for undergraduates and alumni, and later the Manual of Theta Chi Fraternity. Both of these publications have proved helpful to other fraternities in producing something similar for use in their organizations. Following the custom of some other fraternities, Theta Chi some time ago established a number of awards and recognitions. These were all originated and designed by George Chapman and through his efforts approved and established by the Grand Chapter. Unique among such recognitions is the Appreciation Award which honors and recognizes women who have aided the fraternity or the fraternity system. Theta Chi is perhaps the only fraternity which has an award for women. George Chapman has been accorded honors by his fraternity- the Distinguished Service Award, Alumni Awards presented by his chapter and by the Grand Chapter, and the Silver Legion Certificate. He has also been made an honorary member of more than 60 chapters. His wife appropriately wears the Appreciation Award. Governors of various states have also conferred recognition. He is goodwill ambassador for the state of North Carolina, has been commissioned lieutenant colonel by the governor of Florida, and appointed an admiral in the navy of the state of Nebraska. Following a romance which started in college, George Chapman married Mary E. Craley. They have three children, all married, and five grandchildren. His sons, George, Jr., and Philip, are members of Theta Chi. His daughter, Ann, and daughter-in-law, Marion, are members of Kappa Kappa Gamma. His son0in-law is a Beta Theta Pi. The Chapmans live in Meadowbrook, Pennsylvania, northern suburb of Philadelphia. They are members of the Society of Friends. Not alone has been recognized on the basis of loyal and effective service as the fraternity;s executive director since 1947. He was president of the Philadelphia Alumni Chapter for a year and is a member of the board of directors of the Omega Chapter Alumni Association. He is a member of the National Interfraternity Conference House of Delegates. He is also on the executive committee of the College Fraternity Secretaries’ Association and continues to edit its News and Notes. When the National Interfraternity Conference opened its national office in New York City several years ago he was appointed a member of the office committee, which has been in charge of setting up that facility and overseeing its operation, and he continues in this capacity. With a background of practical experience on more than 40 years of service for his fraternity as layman and professional, George Chapman is sometimes called Mr. Theta Chi. Knowing that his fraternity is only as strong as the system of which it is a part, he is a strong believer in sharing ideas and procedures with other fraternities and believes in doing everything he can to help and further the fraternity system. And he practices these beliefs. Honorary member: of Omega Chapter, Dr. Raymond Adams Dutcher, 76, professor emeritus and for 30 years head of the Department of Agricultural and Biological Chemistry at Pennsylvania State University, died suddenly in Fort Myers, Florida, on April 20, 1962. Dr. Dutcher was graduated in 1907 from South Dakota State College, and did graduate work there, and later at the universities of Missouri and Illinois. He was n member of the faculties at Oregon State and Minnesota before going to Penn State in 1921]. Following his retirement he taught at University of Florida and did consulting work. Theta Chis at Penn State unanimously elected Virginia Mayo, motion picture star, official "Dream Girl of Omega Chapter for 1947." The selection was a result of Sammy Kaye's song, "The Dream Girl of Theta Chi." Carl Post, publicity director of Goldwyn Inc., Miss Mayo's company, notified Omega that this choice will gain national publicity. Fatally injured by a hit-and-run drivers, Robert L. Weaver, ex-'48, Oklahoma A&M, ex-'48, died November 15 at Norristown, Pa., without regaining consciousness. Although cap prying a lighted flashlight, he was struck by a speeding sedan while he was walking against traffic on the highway near the house of his parents, Mr. and Mrs. J. Kennard Weaver, the former a Philadelphia attorney. Robert, was was 25 years of age, became a Theta Chi at Penn State where he was active in athletic affairs, serving at one time as football manager. As he was interested in animal husbandry, he transferred to Oklahoma A&M, where he was largely responsible for the founding of the local group which was installed as Gamma Zeta Chapter May, 3, 1947; as president of the chapter he received this charter. He did not return to college last fall because of a throat difficulty. As his service to Theta Chi was so outstanding the Grand Chapter awarded the Reginald R. Colley Trophy to him posthumously as the outstanding Theta Chi undergraduate of 1947. The following tribute was part of a letter received by Robert's father from Daniel Harris, the roommate of Robert. "A group of boys will meet this week and every week in a acuity far from Bob's home. This group will live together for an ideal he believed to be right. New members will come in a continuous stream to catty in this ideal, even though they will have never met Bob personally. I think you are fortunate in knowing that, though Bob has passed physically front he scene, he will actually always be a dynamic park of Gamma aZeta Chapter. The number of men who can create anything worth while in a lifetime is extremely small. Bob created in less than half a lifetime." Col. William I. LeVan, Penn State, '32, who left the Army after overseas service of four and a quarter years and with the Legion of Merit and Bronze Star, as well as other decorations is working for his Ph. D. degree in electrical engineering at the University of California. The resignation of Frederick W. Ladue, Colgate, ‘12. recently an executive secretary brought to an end a remarkable record of almost continuous service to Theta Chi Fraternity in the past thirty-five years, moat of it in official capacities. His successor is George W. Chapman, Penn State, '20, who has also served the fraternity in various ways. During Ladue's absence, George W. Chapman handled the work of executive secretary on a part-time basis; his appointment as executive secretary was made effective as of February 1. He has a background knowledge and experience which should serve him and Theta Chi well in his new work. A graduate of engineering of the Pennsylvania State College, he was resident of the local fraternity which became Omega Chapter, and he continued as president after its installation. As an alumnus he served a number of terms as president of the Omega Alumni Corporation and as president of the Philadelphia Alumni Chapter. He has represented his chapter as active or alumnus delegate at many national conventions. In his college days he was active in sports and college publications and became a member of Pi Delta Epsilon. As chairman of the Regional Plan Committee he helped to work out and put into effect Theta Chi‘s Regional Plan and was the first regional counselor appointed by the Grand Chapter in 1935 and served as counselor of Region III until 1937. At the Spring Lake convention in 1937 he became a member of the Grand Chapter and was national marshal until 1939. From 1939 to 1946 he was national treasurer, holding this important position through the critical war years. He was a member of the committee which worked out the merger with Beta Kappa Fraternity. In 1939 Secretary Chapman organized and conducted the first School of Fraternity Practices and has directed the school at each convention since then. being given the title of director of leadership training in 1939. Many of the progressive steps in the life of Theta Chi in the last fifteen years are due to the hard work and the intelligent planning George Chapman. He was largely responsible for the writing and adoption of the Objectives of Theta Chi Fraternity; he edited the Handbook of Theta Chi Fraternity, considered one of the outstanding works in the national fraternity world, and he was responsible for the establishment of the Distinguished Service and Alumni Awards, both of which he holds. He edited and compiled the Manual of Theta Chi Fraternity which has recently been published and is being accorded high praise from every quarter. For the last ten years Secretary Chapman has been in the motion picture business, producing industrial, advertising, public relations, and training films. In the war period he wrote the scripts for and directed many training films for the Navy Department, the Army Ordnance Department, and the United States Office of Education. He was recently awarded a citation from the Bureau of Aeronautics of the Navy Department for his war work on navy training films. He has been active for many years in the Boy Scouts of America and has just completed a ten-year term as district chairman in the Philadelphia Council. He is at member of the Philadelphia Council, has served for a number of years as a member of the National Council, and holds the Silver Beaver Award. He is a member of the National Executive Committee of the Order of the Arrow, the Scout honor society, of which he was a charter member and the first chief. In 1925 George Chapman married Mary E. Craley, a graduate of the Pennsylvania State College. They have three children. George, Jr., a former B-29 navigator, who is a Theta Chi at Pennsylvania State College; Ann B., a member of Delta Omega Theta Sorority at Wilmington College, Ohio; and Philip C., now in high school. The Chapman live at Jenkintown, Pennsylvania, not far from the Executive Oﬂice at Trenton. They are members of the Society of Friends (Quakers). George Chapman is a veteran of both wars, having served in the Naval Reserve in World War I and as an officer in the U. S. Coast Guard Reserve on part-time active duty in World War II. He is a member of the Coast Guard League and a past vice-commander of his chapter, and also a member of the United States Coast Guard Reserve. The first edition of The Manual of Theta Chi Fraternity was published in 1947 and edited by George Chapman (Omega/Penn State 1920) along with supplemental information provided by George Starr Lasher (Alpha Gamma/Michigan 1911) Subsequent editions were edited by Dale Slivinske (Gamma Sigma/Duke 1968) and Dave Westol (Beta Zeta/Michigan State 1973). Thousands of brothers have benefited from their experience and knowledge when they first received their copies of the Manual and likely referred to it later in life as alumni.